A concerned, capacity audience about 60 packed a conference room in New York yesterday to hear about and discuss the dangers of Wi-Fi and other radiation. Biggest victims are children, babies and fetuses. They’re higher wattage and configured to be able to serve hundreds of users simultaneously, she said. Presentations included one by babysafeproject.org. Its warnings were similar to the ones expressed on the panel about children and babies May 3 in Baltimore featuring Devra Davis and other EMF health advocates. Another paper on the subject of EMF dangers to babies and children is byBostonParentsPaper.com. Rees, a graduate of Choate Rosemary Hall, Columbia University and the Georgetown Graduate School of Business Administration, has written a 54-part description of EMF dangers and possible solutions that is the most comprehensive overview of the dangers of EMF. New Yorkers and others should pay close attention to Rees since Time Warner, Comcast, Cablevision and other cable suppliers are forcing new 5GHz routers on unsuspecting customers, this writer included. Apprised of this new danger (radiation pulsing 24/7 billions of times a second), we contacted Time Warner and had them turn off the 5GHz and 2Ghz lights on the router. Other customers of the cable companies should do the same. A technician came to our home and found high levels of radiation throughout the apartment and particularly near windows. The highest apartments get the most radiation from hundreds of cell towers atop apartment buildings. The New York real estate industry must look into this problem. The technician immediately shut down Bluetooth on our MacBook and told us to get rid of the landline phone that had a wireless companion. An antenna on the landline part spewed radiation 24/7 and was the same as a wireless phone. 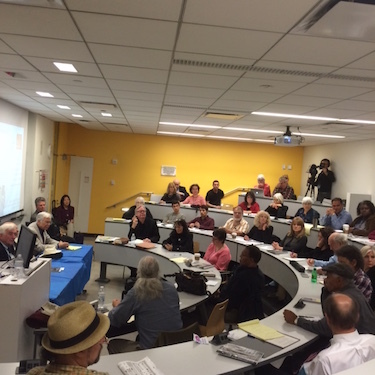 The session on dangers of pulsed radiation was loaded with attacks on corporate players and their alleged allies in the government, echoing the theme of the conference, “Rage Rebellion Revolution; Organizing Our Power.” Nearly 5,000 attended the three-day conference at the John Jay Criminal College. 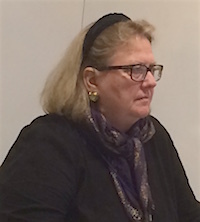 Wi-Fi and computer technology, both with dangerous aspects, permeate school, libraries and public government which have made a huge financial and intellectual commitment to their use and don’t want to walk away from it, panelists said. Doing so would be “biting the corporate hand” that helped finance so much of the technology, they noted. The more than 130 films and VNRs featured in 36-page catalog distributed at the conference by Media Education Foundation include such titles as Pack of Lies: the Advertising of Tobacco; How Racism Harms White America; Big Bucks, Big Pharma; Rich Media, Poor Democracy; Constructing Public Opinion (How politicians and the media misrepresent the public); The Myth of Liberal Media; Shop ‘Til You Drop, The Crisis of Consumerism; How to Start a Revolution; Fire in the Blood, a Tale of Medicine Monopoly & Malice; Google & the World Brain, the Audacious Attempt to Control Human Knowledge; Agrofuels, Starving People, Fueling Greed; Life in Occupied Palestine; Peace, Propaganda & the Promised Land; Occupation 101 (Israeli-Palestinian Conflict). 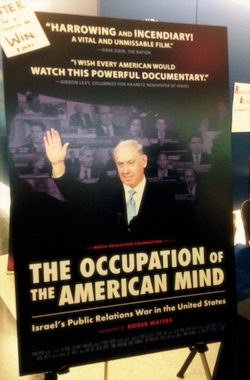 MEF, was selling for $20 a DVD titled “The Occupation of the American Mind: Israel’s Public Relations War in the U.S.,” narrated by Roger Waters. Also offered is the film, “The War Around Us,” by Abdallah Omeish, which tells the story of two journalists who were present during the bombardment of Gaza in 2008-09. The catalog lists seven items telling the Palestinian side of the conflict but none telling the Israeli side. There has been an “explosion in autism” in children in Canada that appears to mirror the explosion in wireless technology, says Jerry Flynn, retired captain in the Canadian Army who supervised its warfare using electromagnetic radiation. Flynn earlier this month asked for an investigation of government authorities in Canada by the Royal Canadian Mounted Police, saying the authorities were “criminally negligent” in failing to remove Wi-Fi and other radiation sources from schools, hospitals, libraries and other public facilities. In the U.S., he wrote May 22 to Prime Minister Justine Trudeau and members of the Canadian Parliament, the rate of autism in children was one in 25,000. In 1970, he said, it had climbed to one in 2,500; in 2000, one in 150, in 2004, one in 125, in 2008, one in 88, and in 2013, one in 50 and one in 27 in populated cities. Quoted are statistics compiled by the Australian ADHD Foundation. He includes cellphones, wireless utility meters, cordless phones, GPS satellites and cellphone towers. They never “shut off,” he said.